Tuesday June 30 1908 I was busy with the work all day, ironed in the morning and washed windows and put screens in all over the house did sweeping etc. I dressed a chicken for tomorrow. Rob & Cora were to be married at 8 oclock tonight. Wednesday July 1st 1908 I got my work done early. Nellie and Mrs [Bremer?] with the children were out for the day. They seemed to enjoy the dinner and we had a pleasant days visit I did my evening work. The boys plowing corn. 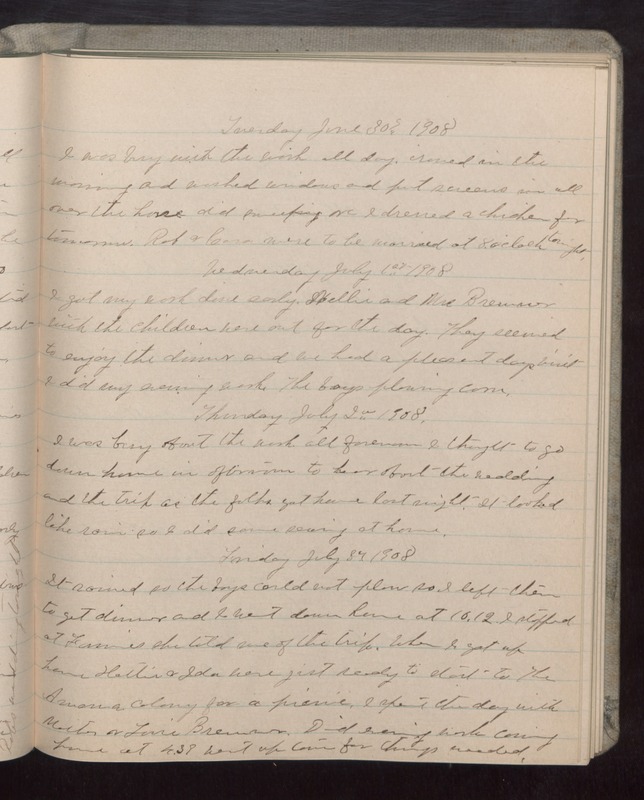 Thursday July 2 1908 I was busy about the work all forenoon I thought to go down home in afternoon to hear about the wedding and the trip as the folks got home last night. It looked like rain so I did some sewing at home. Friday July 3 1908 It rained so the boys could not plow so I left them to get dinner and I went down home at 10.12. I stopped at Fannies she told me of the trip. When I got up home Hattie & Ida were jist ready to start to the Amana Colony for a picnic. I spent the day with Mother & [Louie?] [Bremer?]. Did evening work coming home at 4.39 went up town for things needed.